Hello all, I recently found this website after years of toying with the idea of building my own car. At the moment I don’t have the space to go full size so I have been working on scaled prototypes to get much of the details sorted out before I get to the real thing. I don’t have enough experience with CAD work to make the beautiful 3D renderings that I have seen in other build on this site, I do everything by hand on paper. I have done 2D CAD drawings for specific parts that will need to be sent out for machining. 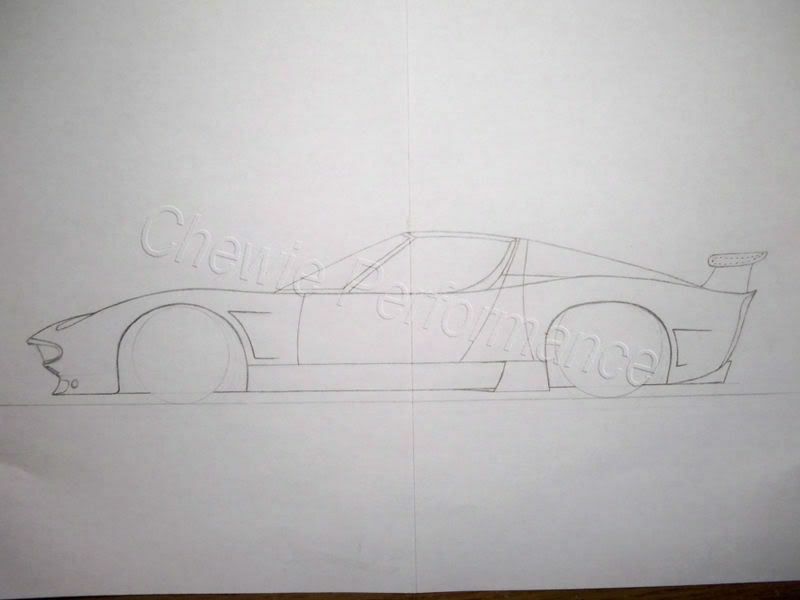 My design is based heavily on the original Miura and Miura concept cars. I just love the style and classic lines but I want something a little more unique than a straight replica. I have taken my favorite elements from various cars and combined them into something unique. The body closely matches the original but I plan on tweaking the lines a bit to update the looks. Overall, I’ve tried to integrate modern aerodynamics and styling to update the classic Miura. I am still undecided about the building of the body. Parallel Designs in UK has started offering Miura bodies based on the Prova molds and they look very Very good but between the cost, shipping, and planned modifications it almost might be better to start from scratch. At this point I feel that even with he various modifications, the parallel body will save me a ton of work. They also sell glass, headlights, and various hardware that would speed my build time. In the near future I will be building some scale bodies and testing various tweaks to the body. It will be mostly style changes but I’m pulling some strings so I can stick the body in a wind tunnel for some serious testing! The chassis will have to be built from scratch. The parallel chassis is very nice but it is designed for specific components that are not readily available to me. I plan to use corvette c4 or c5 components for the main suspension. The chassis will either be a steel space frame or aluminum monocoque. I have experience working with aluminum and I feel it would be an interesting challenge; however steel is more traditional and easier to build with and repair. The drivetrain is where my questionable sanity really shines. The engine will be a BMW v12 mounted transversely as in the original. I would love to twin turbo it for that additional kick and cool factor. The transmission is the tricky bit, there aren’t many transverse 6 speeds that will handle to power of a twin turbo v12 and still fit the tight space. I am still looking for that perfect transmission but at this point I am even considering custom adaptations utilizing T-56 parts and very elaborate adapters. If you have any leads on suitable transmissions please let me know. If I go ahead with the T-56 idea I’m very tempted to send a torque tube up front and make this beast AWD! But that is more pipe dream than realistic. I have learned in my previous message board experience that a newbie is totally useless without pictures so I’ll start off with my favorite drawing so far, Just a simple side view of the car with the various body modifications. I will be uploading more of my drawings in the future to show more aspects of my design. Hopefully this one drawing will tide you over for a while. Unfortunately this is a long term hobby of mine so don’t expect any blistering progress, I pick at it when I can and that’s about it. I’m hoping to have a garage soon so I can start buying up the big pieces and getting into the nuts and bolts of it. If you have any comments, suggestions, or ideas about my project, Please let me know. Sorry for my rambling, I just love talking about my project! I congratulate anyone who actually read through all of that! Thanks. If you're willing to think outside the box, I have ideas and have figured out mechanically how to use a 2.6L twin turbo 500hp Inline 6 and AWD and have the engine mid mounted! This setup will also handle up to 800HP if the engine was fully built and boosted higher. Sure, I have no attachment to the box. I'd like to keep the v12 for the sake of one being in the original but I'm constantly considering other options. Which engine are you looking at? The only straight six I can remember that puts out those numbers at 2.6L is the RB26DETT. If that's it then the entire skyline drivetrain could possibly be flipped and adapted to run in an aft-mid engine configuration. I think I have some nifty skyline drawings around here somewhere that would help visualize the package. If I find them I'll post them up. I have not been able to find much of anything about how it was done, but at least we know that its possible! I just received some info from the RB gurus.. Overall, the idea isnt the best. The Tommy Kaira uses a totally custom drive line. There is no easy way to flip the direction of the skyline parts. The front diff housing doesnt have the space to flip the ring gear so you would need to install some kind of gearing unit to reverse the rotation either before the t-case or at the diff. Both require some spendy machining and the front diff isnt very strong anyways. Now plan B in this case would be to keep the rb and replace the skyline drive train with stronger more adaptable parts. You pick the trans, I happen to like the t-56. You pick the t-case, I know there are some strong ones out there from the off roaders, trick is finding one small enough for a sports car. Front diff would be easy, there are plenty of irs diffs available, corvette, viper, etc. The rear diff is going to be tricky but the new style offset IRS front differentials could be adapted to the skyline layout with a custom oil pan. At this point I'm starting to wonder about using this layout but keeping the v12 I had planned on. I should have enough space to run it longitudinal but there is just something about that transverse v12 that is totally cool. and my engineering excuse is that its better for weight distribution. lol. I suppose I'll just have to do more research and drawings and mockups. Archie is doing an awesome job on the miura. I noticed paragon design is selling the prova miura body that they made plugs from for 3,500bp. Parallel has the Prova body listed on two separate pages of their website, one is sold and the other isnt. I'm tempted to contact them about it but reading through Archie's build has me worried about how much effort it will take to make it work. I think it would be a better choice to pay more for Parallel's re-engineered body to save me some work. Archie's build looks great, he's given me a lot of ideas for my build. I'll definitely be keeping tabs on that project. Thanks for the link!